Build or Buy: Develop Staff or Buy Off of the Street? - The Kafafian Group, Inc.
Home > Insights > Strategic Management > Build or Buy: Develop Staff or Buy Off of the Street? News Flash: There are fewer community banks, and those that remain keep getting bigger. During the past 10 years, the number of U. S. banks has dropped by a third and the average asset size has more than doubled. As with consolidation in so many other industries, community bankers must be prepared to meet the challenges of attracting profitable relationships, lowering operating costs, and growing revenue in the face of larger and more sophisticated competitors. In nearly every bank The Kafafian Group (TKG) serves, Strategic Plans identify a primary objective of ‘employee development,’ in one form or another. And in my experience, ‘promote from within’ has been a bedrock principle. Throughout the history of community banking, the case was made for a robust employee development program, a well-communicated and transparent job-posting system, and a bias toward moving existing employees up through the ranks. I have personally benefited from the practice throughout my career. 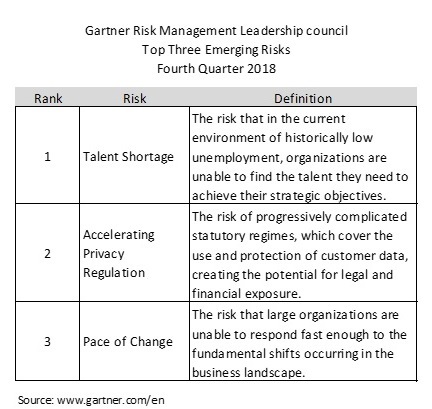 According to a Gartner quarterly survey of Risk, Audit, and Compliance executives, “Talent Shortage” has risen to the top spot as the biggest emerging risk (see table). And according to a study by the Society for Human Resource Management (SHRM) only 26% of open positions were filled by internal candidates. Is this sustainable? The biggest benefit of hiring from within, in our opinion, is the potential to motivate team members and keep them engaged. John Smythe, in his book The CEO – Chief Engagement Officer, defines employee engagement as “the extent to which people are personally involved in the success of a business.” Engagement is chief among traits that determine employee success, along with motivation, determination, curiosity, and insight. Another benefit of promoting from within: lower costs. Even considering the costs of training and career development, hiring from within is less expensive than buying on the street when you add recruitment, starting bonuses, onboarding expenses, etc. One reason, the ‘home team discount’, the lower compensation an employee would be willing to accept, so aptly described in Columbia University professor and bank director Harborne “Gus” Stuart’s book, The Profitability Test: Does Your Strategy Make Sense, more than offsets development costs. Existing employees already understand your culture, your systems, your bureaucracies, and your politics. They are up and running faster, producing much more quickly than new employees, resulting in less customer service disruption. 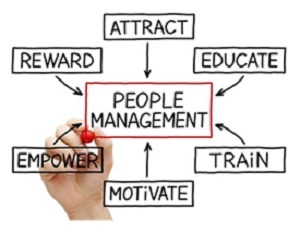 Therefore, it makes financial sense to cultivate, educate, support, mentor, and sponsor employees inside the organization to assure the human capital needs to compete in an ever-tightening market place are met. So, when does it make sense to recruit talent from outside our organizations? There are many situations where bank leaders should consider the advantages of hiring new employees. The most obvious is when a bank is expanding into a new geography or opening new markets. ‘Team lift-outs’ have been used throughout the industry to acquire commercial banking teams, lenders, administrative assistants and credit analysts. The benefits of a team lift-out include keeping a well-functioning team together, and, as opposed to an outright purchase, only willing employees come along. In addition, the team members who are coming are likely to bring only the best and most productive teammates along with well-defined processes. And most importantly, team lift-outs can be quickly accretive to earnings. Acquiring talent helps when developing new functions within the company. Want to expand into C&I or asset-based lending? Identify indirect lending as a niche profit center? Need a wealth management function to cement your reputation with affluent depositors? If any of this expertise is outside of your bank’s current skill-set, hiring from outside is likely the best way to go. New perspectives and best practices are often useful in bursting the insular bubble of an organization. A long-term TKG client had experienced slow loan growth since the recession of 2008. Their 2015 strategic plan had identified ‘Take Advantage of Market Disruption’ as a strategic objective. Several large in-market mergers created a pool of highly skilled bankers who either were displaced by the acquiring bank or were disillusioned by the culture. Executing on their plan, the bank hired an experienced residential mortgage lending leader. In building out the originating, underwriting and processing functions she was able to redirect the energy of the team to focus on quality new business, almost entirely within the bank’s geography. As a result, residential mortgage loans grew by 56% within three years of the lift-out. Diversifying your employee base is not just about filing a satisfactory Diversity Self-Assessment with the FDIC. The benefits of diversity include fostering innovation and creativity, expanding markets for your products and services, improving culture, enhancing the bank’s brand and reputation, and offering better customer service. Hiring from outside the organization is a natural way to diversify your work-force by gender, race, ethnicity, age, military service, and other factors that help bring different viewpoints that more closely identify with your customers and better reflect the viewpoints of the communities in which you live and work. Finally, bringing in new management can help redirect your bank’s culture if the culture is deeply ingrained with existing employees and changing it from within would be a significant challenge. Another TKG client had a retirement at the senior position in their Wealth Management division. Growth in assets under management had been stagnant for years. While existing customers were happy, most were close friends of the bank: directors, large shareholders, and institutions within the community. Service was exceptional; sales were non-existent. The bank had the option of promoting a long-term business development officer or searching for a new leader, skilled in growing wealth management clients. By focusing the interview process on a strategy designed to grow the size of the department, management and the board were able to discover and hire a candidate better suited to drive their strategy. 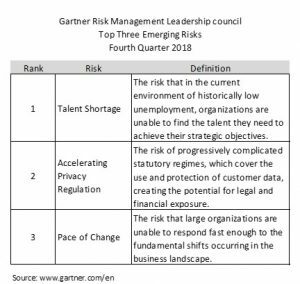 As your bank develops its strategic plan for the next five years and considers succession needs for leadership, management, business development and operations, the highest quality team will be needed to compete in an ever-intensifying industry. As various options are considered when you fill your most critical leadership roles, bankers should take both internal and external candidates into full consideration. Having the right talent to promote from within takes time and resources. We suggest starting now. This newsletter relates to our Strategic Management service, click here for more information. To receive our newsletter and other TKG content, subscribe at the bottom of this page.